One of the things I do differently on my weekend radio show is openly listen to and accept tips and recommendations to try from listeners. Here are just a few of the more interesting ones that turned out to be valid. Blueberries – For increased production, use the Organic Fruit and Pecan Tree program but add coffee grounds to the bed preparation on new planting and as a fertilizer. 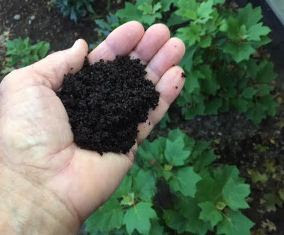 Hard to overuse but start with about ½ inch of coffee grounds over the entire beds. Work into new beds and lightly cultivate the grounds around bushes. Azaleas – Spray Garrett Juice Pro (containing beneficial microbes) on foliage and drench into soil to greatly increase the vigor, color, bud set and flower production. Apply at least on a monthly basis for best results. Grasshopper Program - Apply beneficial nematodes in the spring when soil temp warms. Apply Nolo Bait next - 1st application when instars first start to show, 2nd when more instars start to show. Control is very effective and cost is only about $10/acre. Kaolin Clay can be applied as a last resort. Orchids - Fertilize with Garrett Juice or Garrett Juice Plus to get them to come into bloom. Don’t fertilize while they are in bloom. Provide plenty of light and water every few weeks but avoid overwatering. Another little trick is to put a handful of wine corks in the bottom of the decorative containers so the pots holding the orchids have air space under the roots and the roots don’t sit in water. I have also been questioned about the benefits of mycorrhizal fungus on orchids. Orchids very definitely benefit from mycorrhizae and have it on their own when in a healthy condition. Synthetic fertilizers destroy it. Coffee grounds are an excellent organic fertilizer for orchids and African violets. Coffee Grounds - Old diluted coffee can be substituted for the compost tea in the Garrett Juice formula. Years ago a listener called the show and reported great results using Garrett Juice on his plants, but he felt like it had killed some of his orchids. We responded quickly and added the warning to the label and at the same time tested Garrett Juice on many orchids. We sprayed it, drenched the roots, and used light and heavy applications. Nothing - no damage. Not only did we cause no damage with the Garrett Juice, but the fertilizer value also provided excellent growth and flowers. Toenail Fungus - One of the first great tips was about curing toenail fungus by soaking feet in a cornmeal slurry. Watch this video: How to Use Cornmeal.